Finagle is a protocol-agnostic, asynchronous RPC system for the JVM that makes it easy to build robust clients and servers in Java, Scala, or any JVM-hosted language. Rendering even the simplest web page on twitter.com requires the collaboration of dozens of network services speaking many different protocols. For example, in order to render the home page, the application issues requests to the Social Graph Service, Memcached, databases, and many other network services. Each of these speaks a different protocol: Thrift, Memcached, MySQL, and so on. Additionally, many of these services speak to other services -- they are both servers and clients. 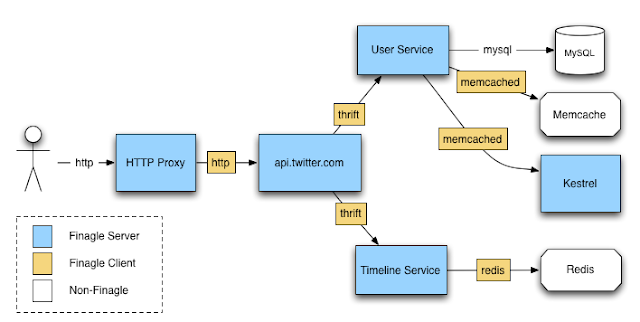 The Social Graph Service, for instance, provides a Thrift interface but consumes from a cluster of MySQL databases. In such systems, a frequent cause of outages is poor interaction between components in the presence of failures; common failures include crashed hosts and extreme latency variance. These failures can cascade through the system by causing work queues to back up, TCP connections to churn, or memory and file descriptors to become exhausted. In the worst case, the user sees a Fail Whale. back-pressure techniques, to defend servers against abusive clients and dogpiling. Changed to a JVM centric approach for hiring and speed of development reasons. Internally they had a lot of people with Ruby and PHP experience, so Scala was appealing. Finagle was a compelling factor in choosing Scala. It is a library from Twitter. It handles most of the distributed issues like distributed tracing, service discovery, and service registration. You don’t have to implement all this stuff. It just comes for free. Once on the JVM Finagle provided all the primitives they needed (Thrift, ZooKeeper, etc). Finagle is being used by Foursquare and Twitter. Scala is also being used by Meetup. Like the Thrift application interface. It has really good performance. Liked Netty, but wanted out of Java, so Scala was a good choice. Picked Finagle because it was cool, knew some of the guys, it worked without a lot of networking code and did all the work needed in a distributed system. Node.js wasn’t selected because it is easier to scale the team with a JVM base. Node.js isn’t developed enough to have standards and best practices, a large volume of well tested code. With Scala you can use all the Java code. There’s not a lot of knowledge of how to use it in a scalable way and they target 5ms response times, 4 9s HA, 40K requests per second and some at 400K requests per second. There’s a lot in the Java ecosystem they can leverage. Internal services are being shifted from being C/libevent based to being Scala/Finagle based. Initially an Actor model was used with Finagle, but that was dropped. For fire and forget work a job queue is used. In addition, Twitter’s utility library contains a Futures implementation and services are implemented in terms of futures. In the situations when a thread pool is needed futures are passed into a future pool. Everything is submitted to the future pool for asynchronous execution. Scala encourages no shared state. Finagle is assumed correct because it’s tested by Twitter in production. Mutable state is avoided using constructs in Scala or Finagle. No long running state machines are used. State is pulled from the database, used, and written back to the database. Advantage is developers don’t need to worry about threads or locks. Redis is used as Gearman’s persistence layer using a memcache proxy built using Finagle. This work by Brandon Chen is licensed under a Creative Commons Attribution 3.0 Unported License.